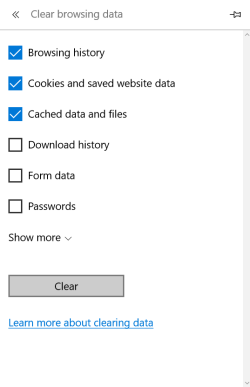 You can clear your cache to delete cookies and website data from your browser. This may help resolve a variety of issues, including trouble when browsing your library website, signing in, or downloading titles. Windows: Press Ctrl + Shift + Del to open the "Clear Browsing Data" window. Mac: Press Command + Shift + Del to open the "Clear Browsing Data" window. 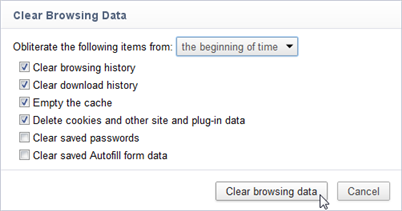 Select the beginning of time from the drop down box. Close and reopen Chrome for the changes to take effect. Press Ctrl + Shift + Del to open the "Clear browsing data" window. 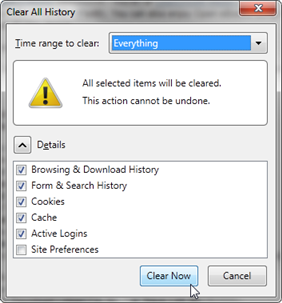 Click Clear to clear your temporary internet files. Close and reopen Edge for the changes to take effect. Open the "More actions" drop-down menu ( ), then tap Settings. Scroll down and tap Choose what to clear under "Clear browsing data." Windows: Press Ctrl + Shift + Del to open the "Clear Recent History" window. Mac: Press Command + Shift + Del to open the "Clear Recent History" window. Select Everything from the drop down box. 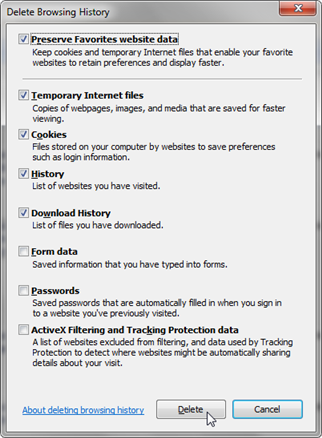 Close and reopen Firefox for the changes to take effect. Press Ctrl + Shift + Del to open the "Delete Browsing History" window. Close and reopen Internet Explorer for the changes to take effect. From the menu bar in Safari, select Safari, then Clear History and Website Data... from the drop-down menu. Close and reopen Safari for the changes to take effect.